Madrid (Spain) – September 16, 2018 (travelindex.com) – The first edition of the UNWTO Tourism Startup Competition, organized by the World Tourism Organization (UNWTO) in partnership with Globalia, the leading tourism group in Spain and Latin America, is the world’s first and largest initiative devoted to identifying new companies that will lead the transformation of the tourism sector and fostering innovation ecosystems through tourism. The semi-finalists have been invited to present their projects in the framework of the official celebration of World Tourism Day in the presence of global leaders in the sector (27 September 27, Budapest, Hungary). 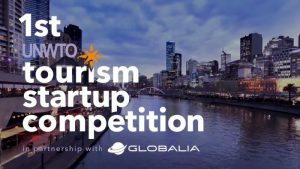 The finalist projects will be presented at the next edition of the International Tourism Fair of Madrid (Fitur), in January 2019.